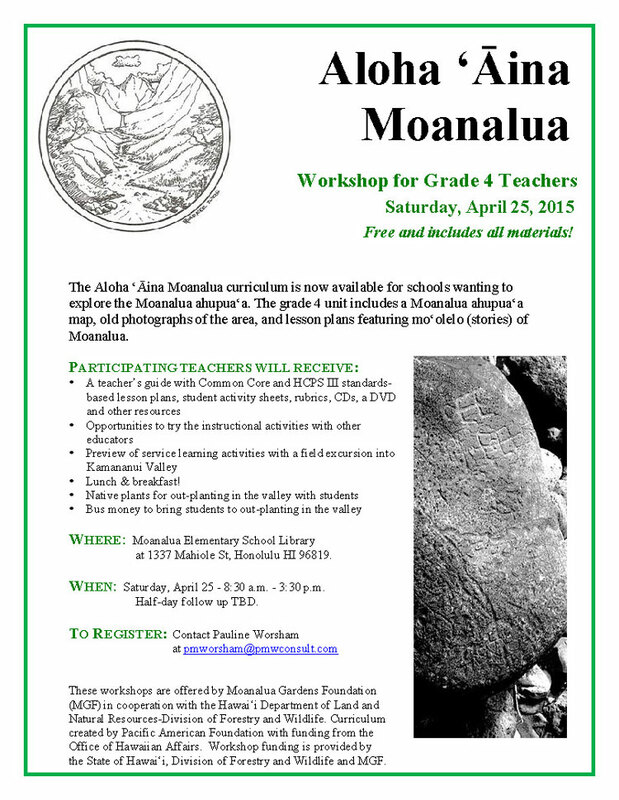 Moanalua Gardens Foundation (MGF) is partnering with the Division of Forestry and Wildlife (DOFAW) of the Department of Land and Natural Resources (DLNR) to offer a free workshop for fourth grade teachers on Saturday, November 4 from 8:30 am to 3:30 pm at Moanalua Elementary School Library located at 1337 Mahiole Street. 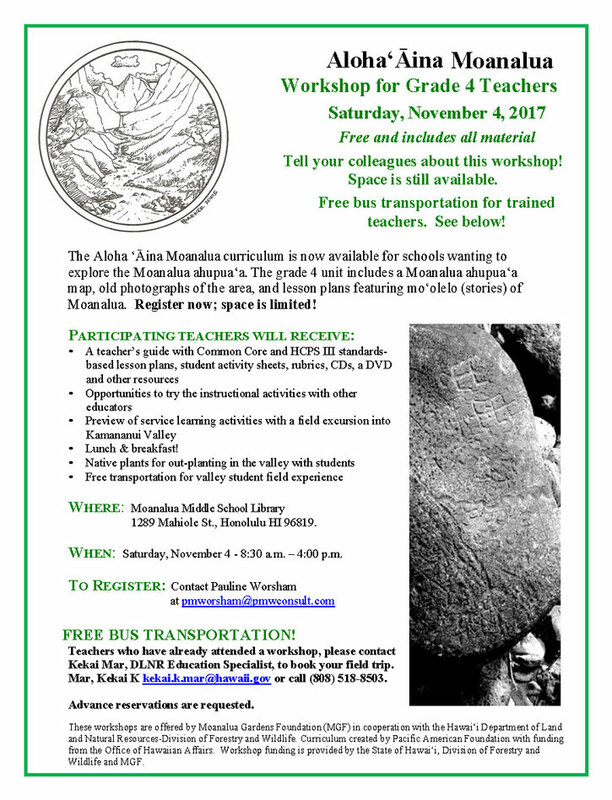 The workshop will introduce teachers to the Aloha `Āina Moanalua curriculum now available for schools wanting to explore the Moanalua ahupua`a (mountain to sea district). The grade 4 unit includes a Moanalua ahupua`a map, old photographs of the area, and lesson plans featuring mo`olelo (stories) of Moanalua. 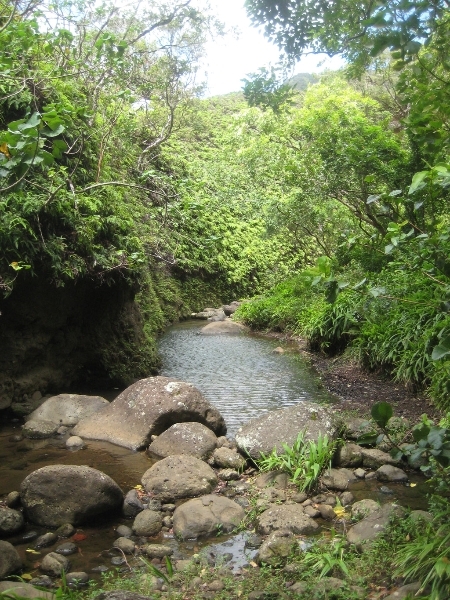 Developed in conjunction with the Pacific American Foundation, the curriculum is the first environmental education curriculum expressly designed to teach fourth grade students about Kamananui, the last undeveloped valley in urban Honolulu once closed for over a hundred years. “We are very pleased to provide our state-of-the-art curriculum to teachers interested in using place and project-based instruction,” said Alika Jamile, MGF’s Executive Director and President. “We encourage fourth grade teachers from all schools, public, private and charter, to sign up for the workshop and begin using it in their classrooms,” Jamile stated. To register for the workshop, please contact Pauline Worsham at Moanalua Gardens Foundation at pauline@pmwconsult.com or call (808) 497-4084. Click here to download flyer. Workshop funding is provided by MGF and DOFAW. The Office of Hawaiian Affairs funded development of the Aloha ‘Āina Moanalua curriculum through a grant to MGF. A 501(c)(3) non-profit organization founded in 1970, Moanalua Gardens Foundation (MGF) is committed to preserving and perpetuating the native culture, environment, and people of Hawai’i through education, and stewardship of Kamananui Valley and celebration of the Prince Lot Hula Festival at Moanalua Gardens. 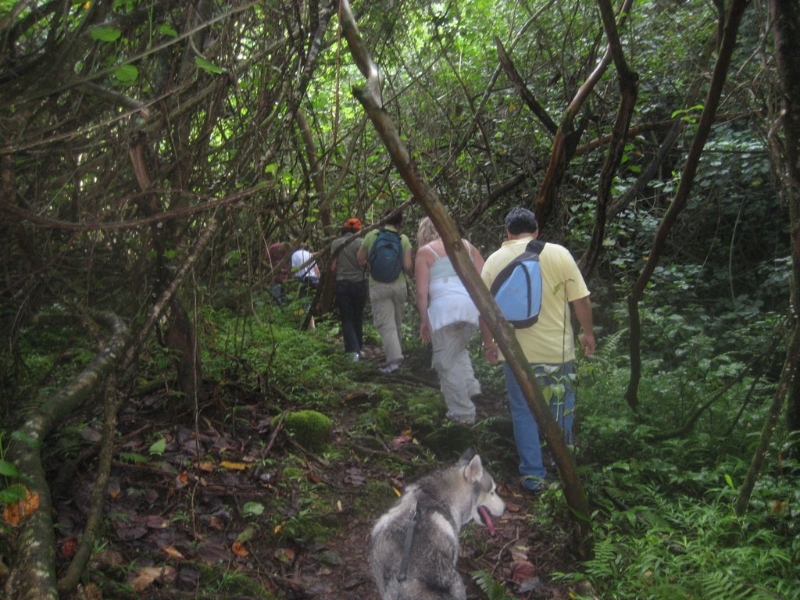 To become a member or for more information, please visit MGF’s website at www.moanaluagardensfoundation.org or call 808.839.5334. Photo provided by Will Page. 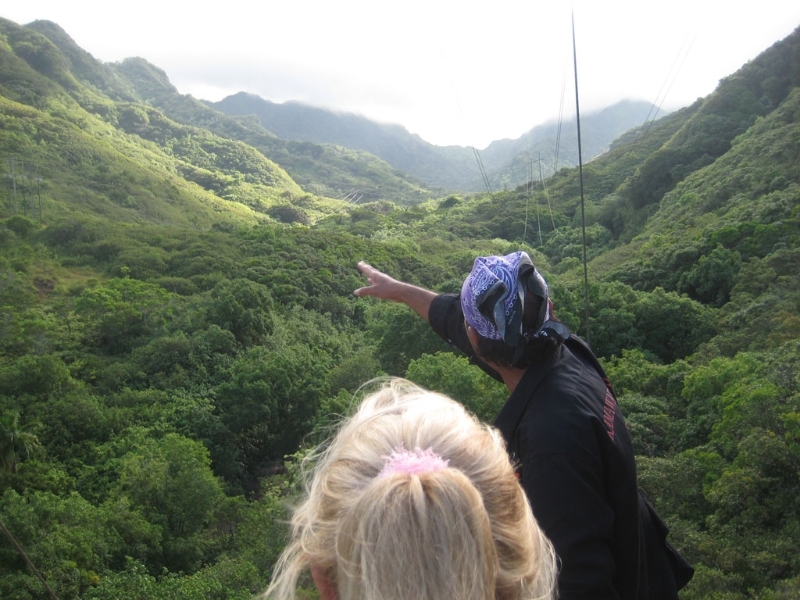 Launched in 2008, Huaka`i o Kamananui, a journey through Kamananui, is an initiative begun by Moanalua Gardens Foundation (MGF) to improve the infrastructure of Kamananui (Moanalua) Valley and to provide educational opportunities for school children. Known in ancient times as a center of hula and chanting, KamananuiValley is the only undeveloped valley in urban Honolulu.Closed to the public for over 100 years, Kamananui (Moanalua) Valley was dedicated in 2008 for public use and now offers a new and pristine learning environment for the public and school children. 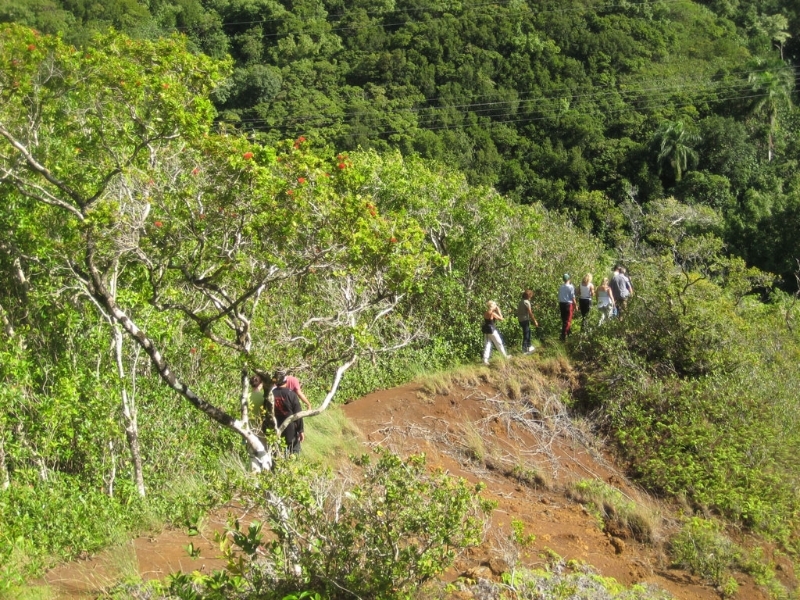 MGF is currently working with the State Department of Land and Natural Resources (DLNR) to improve the valley’s main access road so that it will be easier to traverse by all users.A pioneer in environmental education, MGF introduced in 2012 Huaka`i o Kamananui, Aloha ‘Āina Moanalua, an innovative place and cultural-based curriculum, focusing entirely on the ahupua‘a (land to sea district) of Moanalua. The curriculum provides a unique opportunity for students to truly connect to the cultural traditions that have been passed down through the generations. The program is well underway in O‘ahu’s elementary schools and the history of Kamananui (Moanalua) is now coming alive for hundreds of fourth-graders each year.